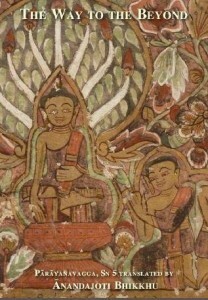 Parayanavagga or The Way to the Beyond is a controversial part of the Pali Canon, some of the earliest known written Buddhist texts. Research indicates that Parayanavagga might even be the oldest part of the Pali Canon. The suttas is a record of conversations between the Buddha and sixteen Brahmin meditaton masters which resulted in their awakening. Parayanavagga is radical in the sense that it stresses the overall importance in non-attachment to all views and ideas, and at the same time it rejects asceticism. This is the fourth way of Theraveda Buddhism, one could be led to think, since the texts describes spiritual transformation as a process out folding in the midst of everyday life of the practitioner. Pārāyanavagga is a group of Suttas from the earliest Buddhist literature. It place considerable emphasis on non-attachment to all views.